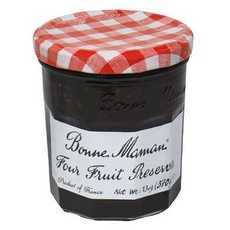 Enjoy Bonne Maman Four Fruit Preserves . Ingredients: Fruits (Cherries, Strawberries, Red Currants, Raspberries), Sugar, Cane Sugar, Fruit Pectin (Note: Description is informational only. Please refer to ingredients label on product prior to use and address any health questions to your Health Professional prior to use.